Bathrooms can be tough to get right. It’s a challenge to get the perfect design and is often one of the most dreary rooms in a house. However, it doesn’t have to be that way. Decorating the bathroom may just be the challenge you need, considering how much time we spend in there. Typically though, they are one of the smaller rooms in the house, so you need to make sure that everything you put in there looks great. This can be quite a difficult task though which is clearly evident by the amount of bathrooms we see that are overbearing or too cluttered. Sometimes less is more, which is something that we think is true when it comes to a bathroom. To kick things off, we have this beautifully designed powder room. We nicknamed it the lighthouse because of the round mirror that reminds us of an old window on a lighthouse. 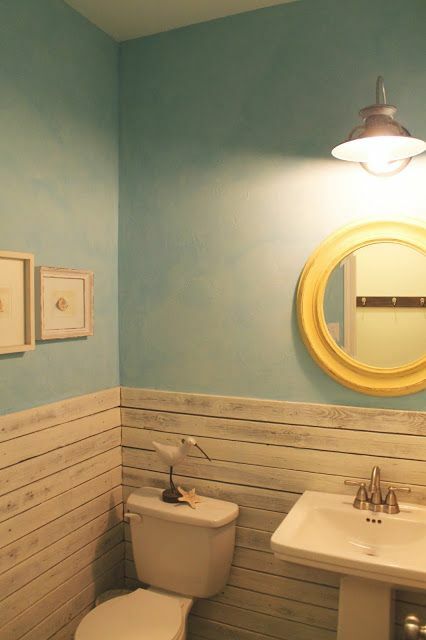 What we love most about this bathroom is the use of the rustic wooden boards and pastel blues. Don’t know why but something about this bathroom just seems so damn relaxing! Another stunning bathroom using wooden boards, this time though they are using more of a brown color. This has the “washed” effect and reminds us of an old wooden ship that has spent its years traversing the oceans. 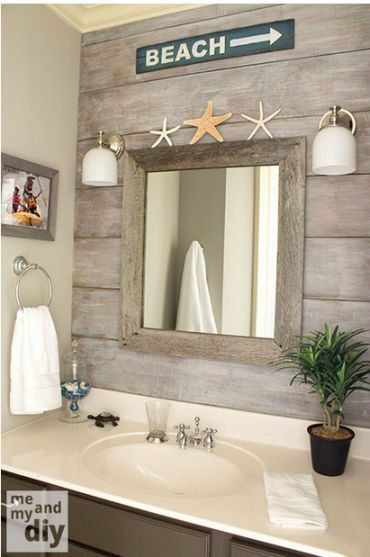 The mirror in this bathroom is great, especially with the starfish sitting on top. However, the icing on the cake is going to have to be the beach sign at the top. It’s a great addition to the laid back style of the bathroom and encourages a relaxing atmosphere. We call this one “unconventional” because it’s a bit different from all the others on the list here. 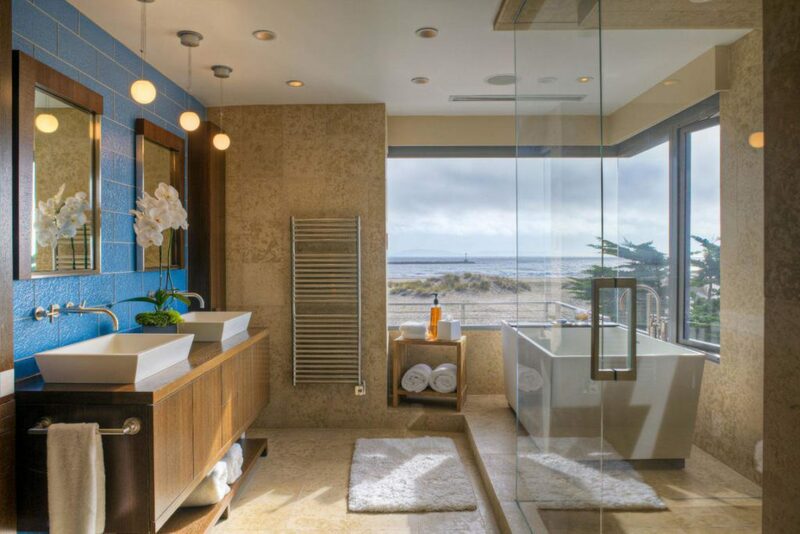 It adopts a modern style of interior design with the basins, shower, and tub, with a beach vibe coming from the colors. This combination works great! You have the lovely blue splash back representing the ocean with the stunning sandy floors and walls. Everything thing in this bathroom is perfect – definitely my favorite (also look at the view!). We nicknamed this one “warm vibes” because, well, it gave us warm vibes. This bathroom is a bit different in its approach and opts to use more vibrant and intense colors and textures instead of the washed out ones that we usually see. For example, you have the near yellow walls and cabinet doors and then the shiny brown basin and toilet lid. However, we fell in love with the picture above the toilet! 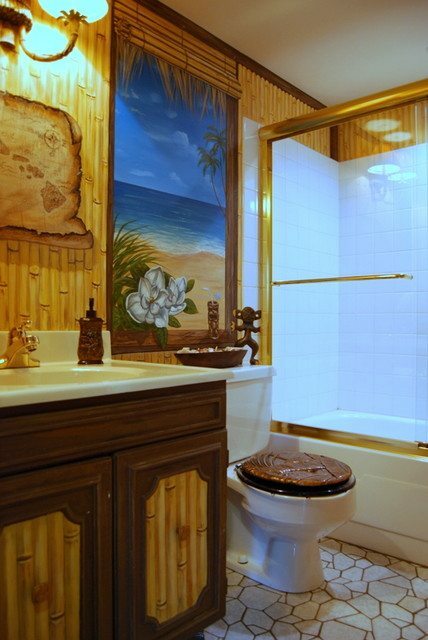 Starfish seem to be a popular trend amongst beach themed bathroom owners, and this one is no exception. 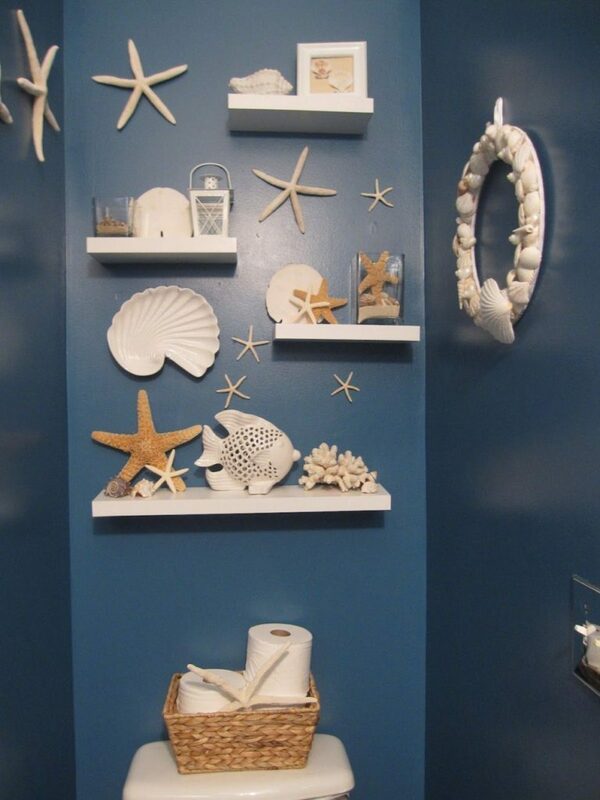 This (small) bathroom features a zig-zagging shelf array full of seashells, coral, and starfish. This creates a pretty nice relaxing atmosphere, especially with the blue walls. 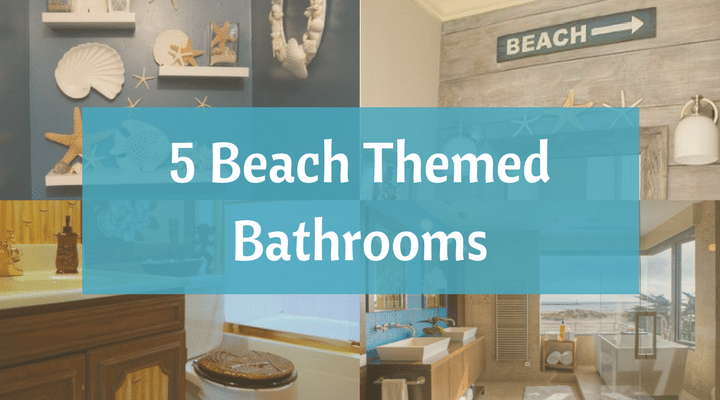 5 Coastal Mirrors to get your Creative Juices Flowing Beach Tile Art – A Splash of Beach Themed Tiles Awesome Above the Bed Beach Themed Decor Ideas Transform your Bathroom with these Beach Themed Accessories!